The chances are, unless you’re a Ukrainian who love Olympic wrestling more than you love air itself, then you have probably never seen Vyacheslav Oliynyk. For the rest of you that are unfamiliar with this guy, he is a former Olympic wrestler who captured a gold medal for Ukraine at the 1996 Atlanta Olympics. Oliynyk, was celebrating his 50th birthday, whilst partying a little too hard, he was pulled over by the police for drink driving. The police attempted to take him into custody when he completely lost it and decided to take the police on, one by one. Unbelievably seven police officers were needed to subdue Oliynyk, they had to use pepper spray and police batons to get him under control. Well, Oliynyk was probably thinking, what’s the point of being a champion wrestler if you don’t put your skills to use, when you need them.. Right? In the video, you seen Oliynyk arguing with a police officer straight after he was pulled over. Things turn from worse to terrible when he decided to push the officer back, the officer responded with his pepper spray. The use of the pepper spray far from calmed the wrestler, it was more like a red rag to a bull..
After being clubbed again and again with the batons, and being completely bloody as hell, he still wanted more! 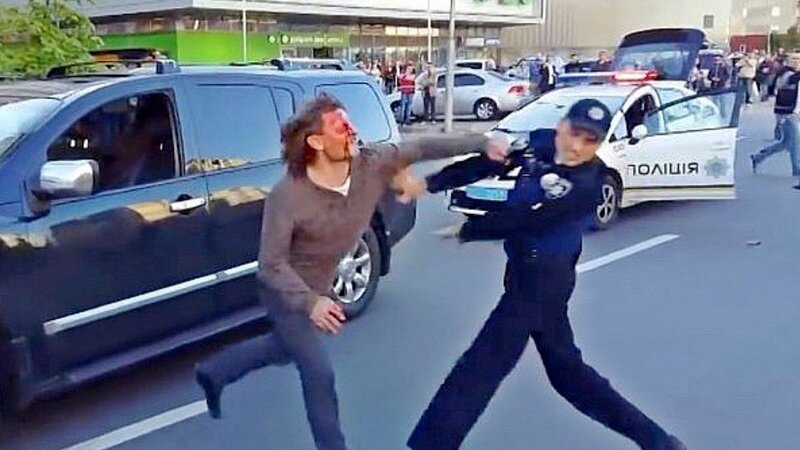 If you are a betting man, and you put your money on lucky number 7, you would of been correct, as it took 7 police officers to eventually get Oliynyk to the ground. Just when you thought it had all come to an end, finally, the officers failed to get Oliynyk in a leg lock to prevent his movement. But because of his wrestling skills, Oliynyk was able to slow the process down. So in stepped a female police officer, to give it the women’s touch, this plan was met with an unbelievable response, check it out for yourself!